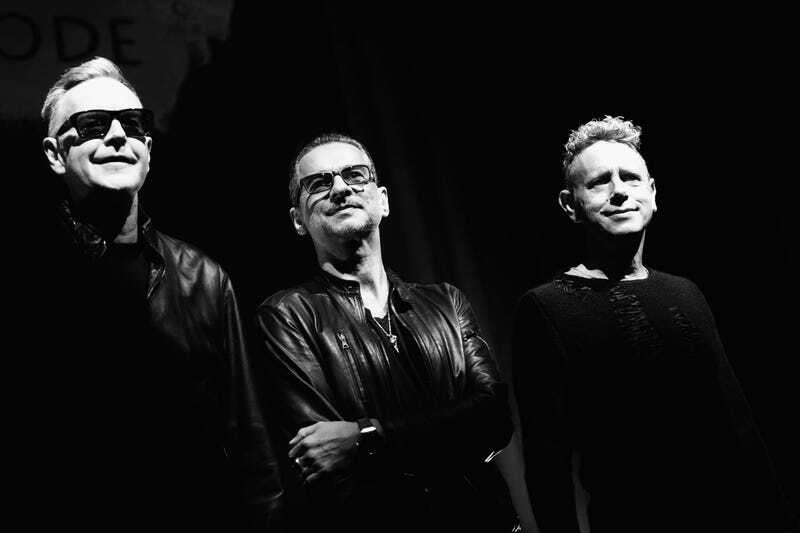 Synth-pop pioneers Depeche Mode are back this month with a new album, their first in since 2013: Spirit is out March 17 on Columbia Records. For many fans, the timing of its release is just further proof that the band will only release an album every four years. Still, many of the songs on Spirit are concerned with the state of the world today, especially the lead single, “Where’s the Revolution?” The current political climate imbues this album with a sense of urgency, whether or not it inspired it. We spoke to Fletch and Martin Gore over the phone about Spirit, what the album name means, how it was made, and what it all means. TrackRecord: What was working on the new album like? Fletch: Have you heard it? TR: Yes, I’m on my third listen right now. F: Good. It was great. We have a different producer this time, James Ford, and we worked at a much faster pace than we normally do. We actually finished early, which is unbelievable. It normally is four sessions, plus mixing. This was done in three sessions. Normally we finish the album just before Christmas, then we go out, have a couple of weeks off before we go into promotion mode. But this time, we actually had some more time off. TR: Is Spirit’s title in reference to anything in particular? TR: Your lead single, “Where’s the Revolution” seems timely considering that atmosphere that we’re in. What was the timeline on that? How did that come about? F: Martin wrote the song a couple of years ago, so you could say it was “ahead of the time,” funny enough… Martin sort of dabbles in politics, but with everything going on, he’s getting more and more interested, like everyone in America I suppose. And the world. Politics is in vogue at the moment. Martin was inspired and wrote quite a few of the tracks on the same theme. It comes out now, so it seems very topical, but we didn’t jump on the bandwagon because it was literally a couple of years ago. TR: Right. I was curious about that track, and the title of the album and was wondering if the two were interconnected. F: Even Dave’s [Gahan] tracks, which sound like relationship-type tracks, actually aren’t. [Dave and Martin] were sort of writing about the same things at the same time. [We’ll have] to see what our fans think because they’re the most critical of all. TR: How is the new album different thematically from your earlier work? F: It’s different from the last three albums, which leaned more towards blues. So it’s a step away from the blues—not 100 percent, of course [...] What I like about the new album, it’s diverse. You can’t say that it all sounds the same. There’s upbeat tracks, there’s slower tracks, on that level I think that’s good. It’s certainly going to be one of those records where I think fans take different songs as their favorites. TR: Are you looking forward to going on tour since it’s been a few years since the last time you’ve been on tour? F: Of course we’re looking forward to it. We do two things, Depeche Mode: we make a record and we tour. Both those things are just as important as each other. Certainly, by touring, it’s helped to establish for ourselves as one of the top bands around with our live performance and our live visuals. It’s strange because we’re getting older now, obviously. The older you get, it’s not so much the shows, but it’s the traveling that gets a bit harder. We don’t party anything like we used to, so you’ll get a more professional Depeche Mode now. Where the concert is 99 percent incredible. TR: Speaking of how do you feel about touring in the U.S. for the first time since Donald Trump was elected president? F: I don’t know. We’re playing mainly cities. We’re not playing particular places where the majority of Trump supporters are. You look at L.A., New York, Miami, Dallas... They’re all sort of anti-Trump, aren’t they? F: An interesting thing is that we record an album every four years. The first year of recording is always when the American election is on, so we’ve become experts on American elections. We’ve got our own problems in Britain with Brexit, so that’s a really big deal that we’ve got. TR: That being said how do you feel about the band being dragged into this political talk? F: It’s not calculated. It’s how [Martin] felt when we wrote these songs. Normally, we write songs about the world we live in and life in general, you know about relationships and problems that people have in their lives. Martin felt there were so many things going astray, that he felt that he should write about it. Whether the next album will go back to normal matters, I don’t know. Martin Gore: It was good. It was fun. We actually finished at a breakneck speed, much earlier than we were supposed to, which is always a nice feeling. We were able to able to cancel a six-week period that we had in New York. MG: We worked with a new producer [James Ford]. I think he did bring, apart from the speed, a slightly different sound to the record. I think thematically it’s different than a lot of our recent albums. TR: It’s safe to say that your last couple of albums were blues-influenced. Would you say that this new album is a step away from that and towards a more electronic sound? MG: Again, it’s always difficult for us to judge from the inside out. I think Delta Machine was particularly bluesy, and we were going for that. This one, although there is quite a lot of a guitar on it, I think it’s more electronic than our last few albums. MG: “Where’s the Revolution” was written at some point in 2015. I think, there was a sense of things going wrong and the world wasn’t in a great place then. That was pre-Brexit, but you know there were awful problems going on. The Syrian crisis had been dragging on for years… I live in America, and around that time there were blacks getting shot on a kind of weekly basis by the police and rioting, you know—the whole Middle East, is just a big mess. I can’t believe the West has sat back and watched Syria get worse and worse and worse. It’s a very difficult problem to solve, especially when the Russians and the rest of the world are on different pages, but you know on a humanitarian level it’s just—I can’t believe people can sit back and let it happen. TR: Right. I read in Rolling Stone and other publications that you called Spirit a “humanistic album.” Would you say that you all produced this album for us to evolve spiritually or be compassionate with each other? MG: I think the more the world, splinters and fractures apart, the worst it is for everyone living here. I just don’t understand how people can’t realize that we are all one, and the differences between us are so minute. Why are there so many wars? Why is there so much friction? It baffles me because I don’t feel that way at all. MG: I think we just have to—although the album is whatever you’d like to call it, “humanistic,” maybe slightly political… I think when we get out and start actually playing shows, we have to put that to one side and realize that we are entertainers. People want to be entertained. It’s depressing. I fall for it. I get alerts everyday from the New York Times, the Washington Post, wherever, and it’s so depressing. I think for the two hours that we’re on stage, people want to forget all of that. Although, we’ll be playing songs from the new album, I don’t think people will be focusing on what’s going in the world during those moments. And of course, we’ll be playing lots of other songs, that come from other albums that don’t deal with any of it. I feel like people need a little light relief. We are looking forward to getting out and touring in general. It’s quite nice that we work in a four-year cycle. By the time we finish a tour and take a break, we’re kind of itching to start writing again, and itching to get back in the studio. When we finish an album, it’s been four years since we’ve done any sort of touring, and we’re itching to get out and do that. Why Don&apos;t We Talk About Chuck Berry&apos;s Dark Past?